How do I return or exchange something I purchased from Santa Barbara Design Studio? Can I bill to an international address at the Santa Barbara Design Studio website? Can I ship to APO/FPO addresses through the Santa Barbara Design Studio website? Trouble with your Santa Barbara Design Studio Account? When you click "order", one of the selected items is added to your shopping cart. If you want more than one, simply adjust the quantity on the "Your Shopping Cart" screen (that loads directly after clicking the "order" button), and click the "update" button. If you ever want to remove an item from your cart, just enter "0" in the quantity field, then click the "update" button. Once an order is submitted through the Santa Barbara Design Studio Webstore, it goes immediately into the system for processing, and it may be too late to change (all orders, however, may be returned). If you think it may NOT be too late to change, call our Customer Service Department at 800-572-5248, Monday - Friday from 9:00 AM to 6:00 PM EST, and we will do our best for you. Have your Order Number ready for the Santa Barbara Design Studio representative. For over 65 years, Creative Brands Santa Barbara Design Studio has been pleased to extend credit terms of Net 30 Days to qualifying store or institutional customers, and we will continue to offer credit terms in the future. If you have your account number and PIN, you can place an order online and charge to your Santa Barbara Design Studio account. Check the "I would like to charge this to my account" checkbox during checkout. Currently the Santa Barbara Design Studio Webstore offers the same savings offered in our printed catalog. Web-only specials are offered periodically throughout the year. You may subscribe to our list with your e-mail address to receive information about these promotions. 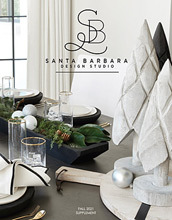 What kind of sales tax do I have to pay when I shop at the Santa Barbara Design Studio Webstore? If your Santa Barbara Design Studio Webstore order is shipped to Arizona or Tennessee, you will have to pay the appropriate sales tax for that state. We are currently unable to process international orders through our website, but we can ship anywhere in the world. For all international inquiries, please email us or call 800-572-5248 Monday - Friday from 9:00 AM to 6:00 PM EST. Please note that we accept only credit card or money orders drawn on U.S. Funds for foreign shipments. Santa Barbara Design Studio does offer domestic drop shipping services. All dropship orders are subject to a $5.00 processing fee in addition to normal freight costs. All dropship orders are shipped ground unless otherwise noted. Express 2nd Day Air and Next Day Air services are also available for in stock items. Freight costs will vary by shipping method. We do not offer dropship service on international shipments. For more information or to place a dropship order please call 800-572-5248. We ship anywhere in the world. For orders outside the USA, you must call our international sales department at 800-572-5248 Monday - Friday from 9:00 AM to 6:00 PM EST or e-mail us. We accept only credit card or money orders drawn on U.S. Funds for foreign shipments. Once an order is submitted through the Santa Barbara Design Studio Webstore, it goes immediately into the system for processing, and it may be too late to cancel (all orders, however, may be returned). If you think it may NOT be too late to cancel, call our Customer Service Department at 800-572-5248 Monday - Friday from 9:00 AM to 6:00 PM EST, and we will do our best for you. Have your Order Number ready for the Santa Barbara Design Studio representative. At this time, gift certificates cannot be redeemed on the website. Please call our toll-free number: 800-572-5248 to place an order using your gift certificate. Items featured in our catalog are purchased months in advance, but unfortunately shipments can be delayed for a variety of reasons. The backorder dates you are given at the time your order is placed may fluctuate due to changes in fulfillment dates from our manufacturers and suppliers and/or transportation delays. If you have a question about a specific backordered item please call our customer service team at 800-572-5248 Monday - Friday from 9:00 AM to 6:00 PM EST. For your comfort and safety, Santa Barbara Design Studio uses secure server technology (Secure Sockets Layer or SSL) to virtually eliminate the risk of an unwanted intermediary obtaining your credit card information during transmission. SSL is the standard in secure Web transactions and is the best technology available today. Orders shipping to APO/FPO addresses must be shipped by USPS. Please call our customer service department at 800-572-5248 Monday - Friday from 9:00 AM to 6:00 PM EST, or fax at 800-572-5248 to place your order. New federal regulations require custom paperwork for items shipping to APO/FPO addresses. Please call our customer service department or e-mail us if you have any questions. Unfortunately this feature is not yet supported online. To protect your account from unauthorized use, we require you to contact us by email or call us Toll-Free at 800-572-5248 to delete any contacts.